A 'SILENT BROTHER' - PERUVIAN LLAMA. Photography © Inna Podziguhn, Irene & Mr. Sheep Co.
Llamas and alpacas have lived in Bolivia and Peru for thousands of years. They were mostly bred for their fine and warm fibers. Llama and alpaca are genetically very close and can interbreed resulting the Huariso and the Misti. There are two types of llama: kcara - a light-fleeced animal used mainly as a beast of burden, and chaku - a heavy-fleeced animal used for its hair. Bolivia is the major producing country of llama fiber and wool. For the last 20 years, Peru has been well known for the industrialization of Alpaca and Llama fibers, and has become the second major exporter of Alpaca and Llama fibers in various forms to the world. Peru has more than 3 million Alpacas, the largest population in the world, and 300 thousand llamas - the second largest population of these animals in the world, after Bolivia, which has more than 3 million Llamas. The llamas are double coated with a coarse guard hair and soft undercoat. The llama's undercoat is about 16-18 micron in diameter, and is finer than the best cashmere. In South America, llama's diet is almost protein free and their outer coat of guard hair can reach 20% of the total fleece weight. In United States, for example, where llamas receive more protein, their fleece have little guard hairs and the fibre diameter is lower. The fiber comes in many natural colors: white, grey, redish brown, brown, dark brown, and black. 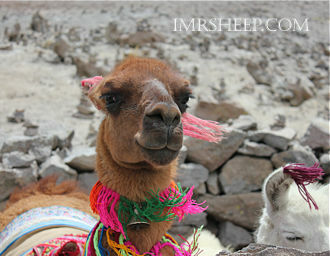 Llama fiber, the so called "Cashmere of the Andes", is non-allergenic in that it does not contain any oils or lanolin. It is not necessary to use bulky yarn in order to obtain warmth. Llama fibre structure is semi-hollow, like a polar bear's coat. This gives it excellent insulation qualities. Llama fiber has not been used extensively, because it is unappealing for the textile industry, thus limiting the industrialization of the Llama fiber. 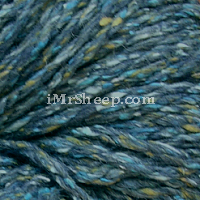 It is used alone and in blends, for knitwear and outerwear. Vicuña is not a domesticated animal, and the majority of its fleece is harvested in Pampas Galeras, a national reserve in the Ayacucho region (Peru). In Inca times, the Vicuña fleece was reserved for the Inca royal family. Its natural colour is fawn, which limits the dyeing process - only darker shades can be produced. Vicuña is the most expensive apparel fibre and it is used for making suits, jackets, and scarves. Guanaco is also not domesticated. Its fibre is harvested in the same way as is the vicuña's. Argentina, Peru and Chile have the majority of guanaco population. The end uses of its fiber is similar to those of vicuña.  Book: Robert R. Franck, "Silk, Mohair, Cashmere, and Other Luxury Fibers"
 Wild Fibers Magazine » Vol 11 Issue 2, 2014 and Vol 11 Issue 1, 2015.  Did the ancient Inca make the finest woolen cloth the world has ever known? 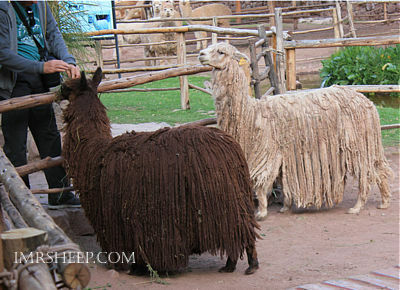  Rocky Mountain Llama & Alpaca Association » LLAMAS ON THE FARM NEAR AREQUIPA. Photography © Inna Podziguhn, Irene & Mr. Sheep Co.